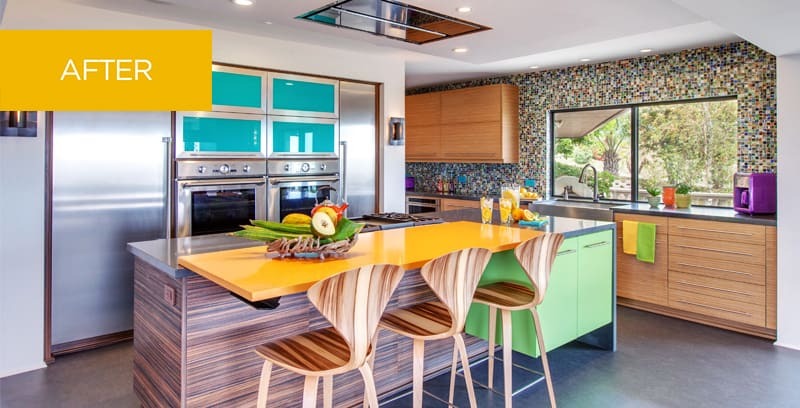 This vibrant kitchen in a mid-century modern home with stunning water views needed a significant transformation to meet the needs of a young couple with a small child. The unexpected color palette is inspired by the first piece of art the couple bought for their baby daughter. Energy and color infuse their new space with a fresh modern attitude grounded with sophisticated architectural elements. 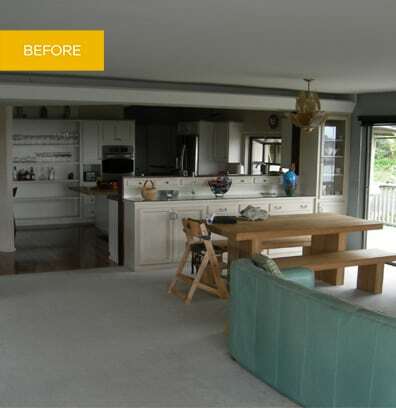 The kitchen was planned with an open design to integrate with the rest of the living area. This kitchen vibrates with exciting shades of orange, green and turquoise. The juxtaposition of colors and textures inspires while providing ultra-modern function and style. Great care was taken in the composition of the ceiling, with three layers built to create a striking architectural element as an interesting design transition between the kitchen and the open living area. The island is a fresh take on pastel-inspired bright hues with visual planes of orange and green against the earthy wood defining the kitchen in inspiring and energetic space.